David Johnston, English teacher, Ruth Galbraith, History and RE teacher and Breege Swinburne, Accounting and Maths teacher, are all bidding farewell to the school. As well as these teachers we also say goodbye to Barbara Hosie who has been in the school for 31 years, serving first as Matron and later as Secretary to the Headmaster. Barbara has been such a central person in the school that all her colleagues as well as the students will really feel her absence when they return to classes at the end of August. She says herself that she will miss Sligo Grammar School as she loved her job and and felt that the school was more like a family home than a workplace. 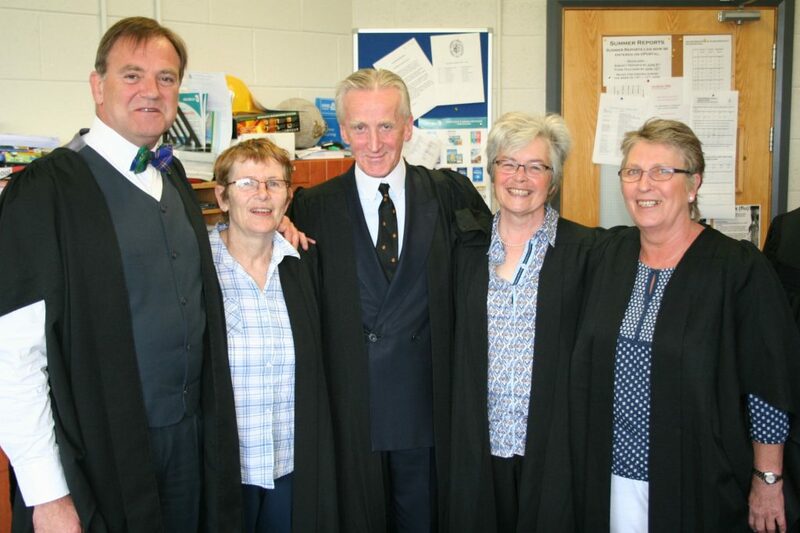 Indeed it was a real “family affair” for Barbara as, first, her daughters and, subsequently, her grandson all attended SGS while Barbara was working in the school. Indeed, in 2016 the family tradition continues when Barbara’s second grandson will enter Sligo Grammar School. David Johnston also leaves us this summer. He has been an English teacher in the school for over 20 years. Well known for his excellent dress sense, David brought flair and panache to the school. He wore the academic gown to class every day and is the last teacher to wear it as a matter of course. As a lover of English literature, David found teaching English to be the ideal job for him as he could indulge his love of Yeats and Shakespeare and all the literary greats. David was always a breath of fresh air around the school and will be missed by students and colleagues alike. In her time in the Sligo Grammar School Ruth Galbraith taught History, RE and Irish. She also set up and ran the “Cabin”, which is the Christian Union meeting room in the school. Ruth acted as Deputy Principal for a time in 2014 and her input to the development of school policies, including an exemplary Literacy Policy and School Development Plan, will be a constant reminder of her dedication to the school. Ruth was heavily involved in the daily life of Sligo Grammar School, for many years directing the school plays and running the school website. She also was the unofficial school photographer, capturing the life of the school on film. We wish her the best in the years to come. Breege Swinburne came to the school 20 years ago, filling in for a teacher on maternity leave. She was kept on afterwards to teach Accounting, and in later years, Maths. As Accounting teacher she worked with senior students, preparing them for leaving Cert and was very successful at this, one of her students achieving First in Ireland in Leaving Cert Accounting. Breege had a great sense of humour much appreciated by her students and also by her colleagues. The Staff Room won’t be the same without her! We wish these, our colleagues and friends, all the best as they leave us and embark on new adventures. They will be missed by all, students and staff, and remembered with affection.